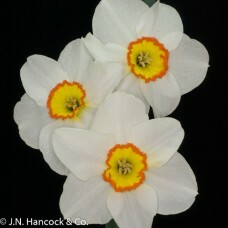 These varieties have an eye-catching two-tone centre, forming a bright, distinctive band. 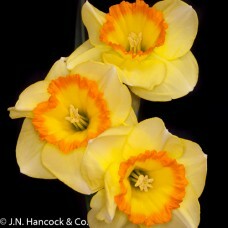 They add variety to the self colours of traditional daffodils. 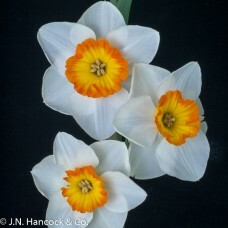 A uniquely coloured decorative flower. 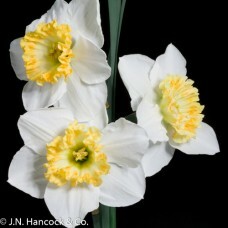 The informal rounded corolla is golden-yellow and the strikin.. Stunning contrast flower. 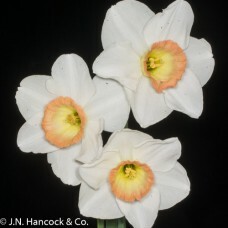 The elegant cup has a heavy band of cherry-pink; broad flat white perianth.. 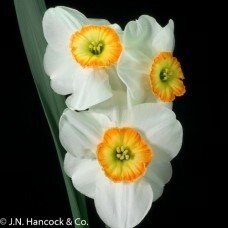 Impressive contrast bloom; the open cup is pale-yellow with a darker, heavily ruffled and pleated ri..
Large attractive flower; perianth of the purest white with an open bowl-shaped cup of citron-yellow,..
Nicely poised, perfumed flower with a pure-white round perianth. 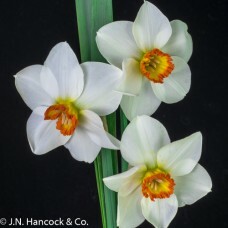 The flat yellow pleated crown is ..
An elegant large-cupped daffodil with smooth broad white petals surrounding a cup of yellow that has..